At The Penny Depot, we care about the art of the pressed pennies that we design and sell, and we would like to share our passion and skills with you. We design, create, and manufacture pressed pennies. The Penny Depot is owned by Michelle Kilcoyne, who currently reside in central North Carolina. Michelle is a graphic designer who has been designing elongated pennies for over 15 years. She designs, rolls, and hand inspects every penny that The Penny Depot sells. Josh and Michelle have four kids and are active in the local pressed penny communities. Since we have started pressing elongated pennies, we have treated every customer like they were a part of our family. There are no other companies that provide the quality of pressed pennies we provide, with the quality customer service to match. 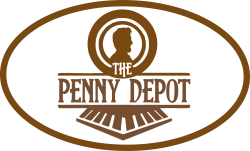 The Penny Depot is the leading manufacturer of pressed pennies worldwide.